This past weekend I participated in my first craft fair in Ohio and spent my first night in Cleveland! It was a lot of fun visiting a part of Ohio I had never been to before. My husband went with me on this trip (thank goodness because we blew a tire on the way home-don’t worry we are a-ok!) and we met up with our friend Cheryl Andrey. She’s the wonderful person responsible for the Sunday Afternoon Housewife logo, and she and her new husband Andrew took us to a delish restaurant called Melt Bar and Grilled. This place was just featured on Food Network, and so you maybe have heard of it! It was simply amazing food. On Saturday my husband and I headed over to set up at the Waterloo Arts Fest, which was a really great festival celebrating a wonderful little neighborhood. I met so many new people, and made some great connections with lots of awfully crafty folks! 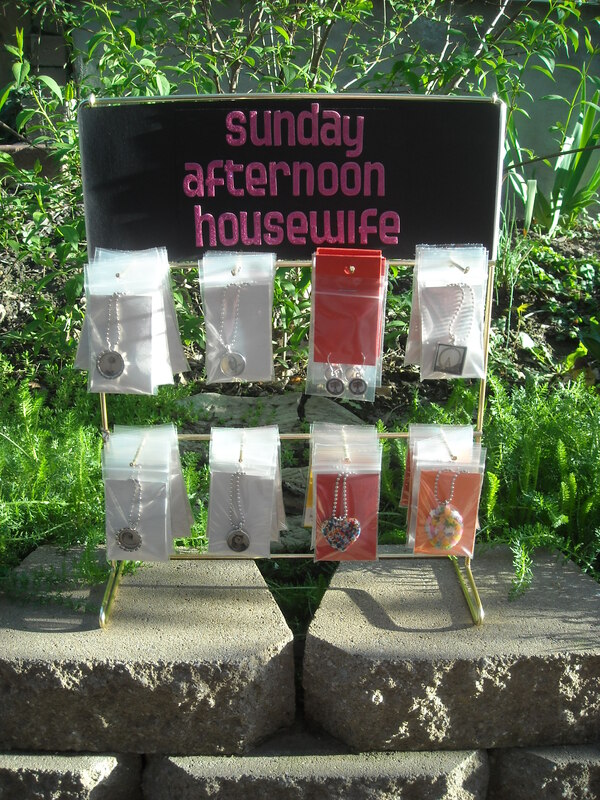 Some of the best news of all to come out of the trip is that the awesome handmade goods store Salty Not Sweet will begin carrying Sunday Afternoon Housewife goods in about 1 week! I’ll update you more about this soon, but now onto the fun photos from the Waterloo Arts Fest! One of my fave things is the truck that you see that looks all black. 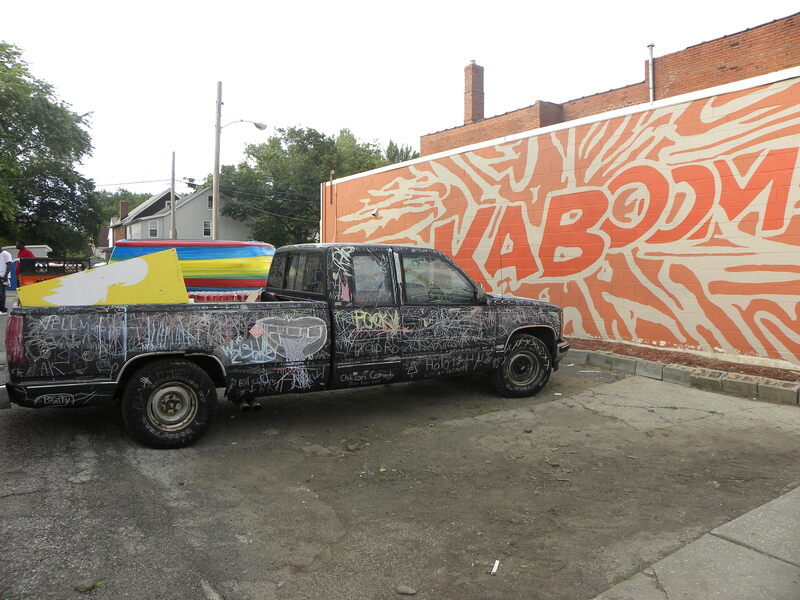 This truck was painted entirely in chalkboard paint, and all the kids loved writing all over the truck with chalk. If I ever have the time (and money! ), my truckie better watch out because this is about the coolest idea ever. 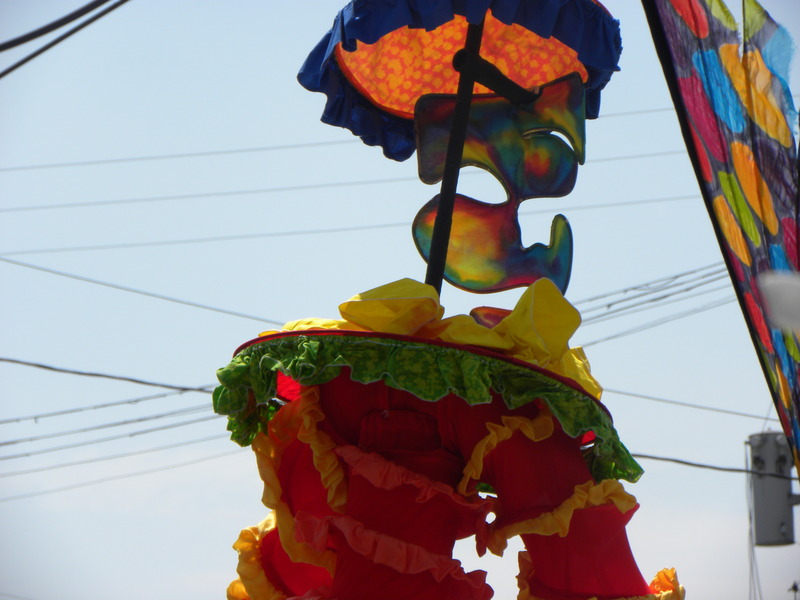 Another thing I enjoyed very much were the stilt creatures. I really enjoyed watching them walk by my booth and battle it out in the middle of Waterloo. What fun! Of course there were all sorts of awesome vendors at the fair. I highly suggest you check out Squeaky Queen Soaps for some awesome soap with fantastic packaging. I scored a bar of Beer Soap made with Guinness Stout and a tube of peppermint lip balm. Both items are just fantastic! 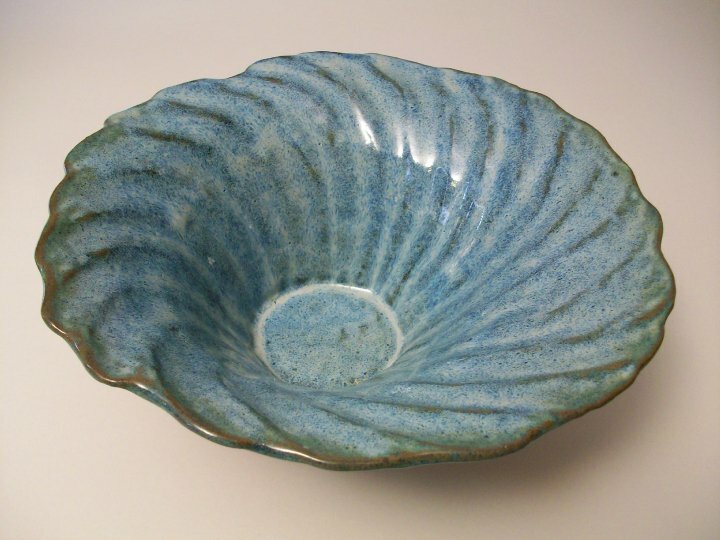 If you’d rather your art last a little longer than a few weeks in the shower, you should check out Susan Cross Pots. Her pottery was just fantastic, and I picked up an adorable salt cellar as a bridal shower gift for a friend. The lovely work of Oceanne made it’s way to Indy for the INDIEana Handicraft Exchange a couple of weeks ago, and thankfully, Anne came down and said hello. It’s always nice to see a familiar face when you are traveling and I can’t wait to see her again next weekend at Bazaar Bizarre! This time I might get a chance to chat a little longer and pick up some of her jewelry! 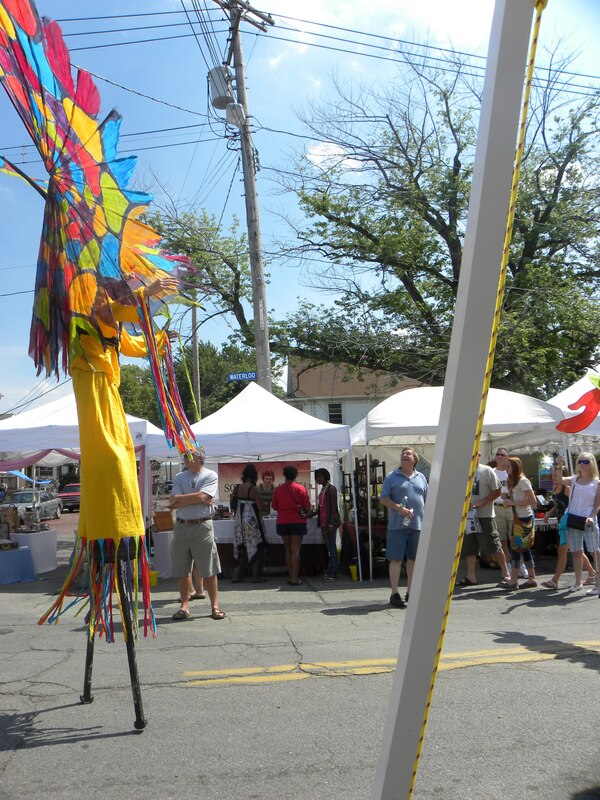 For a full list of vendors who were at the fair, you can click here. I really enjoyed getting to see some new stuff and meet new artists. Thanks to everyone who stopped by to see me. 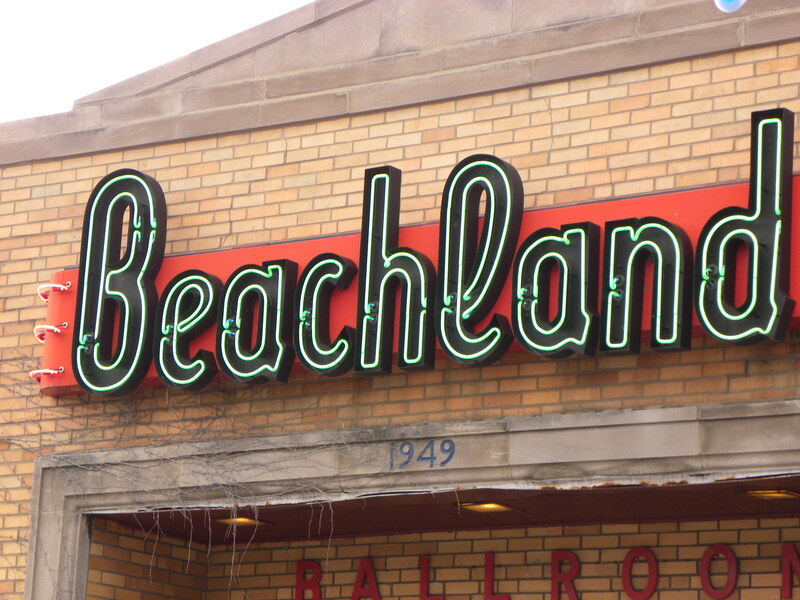 I’ll be back in Cleveland again this Saturday, July 3rd for the Bazaar Bizarre. I look forward to spending even more time in Cleveland, eating more awesome food, and meeting even more awesome artists. This past weekend I was down in Nashville, Tennessee with my booth mate Jen Wyric of EleanorMac for the East Nashville Arts Fest. While I have been to Nashville several times over the past decade, this is the first time I have ever spent time in East Nashville, and I must say I’m in love! And they have Tofu dogs! 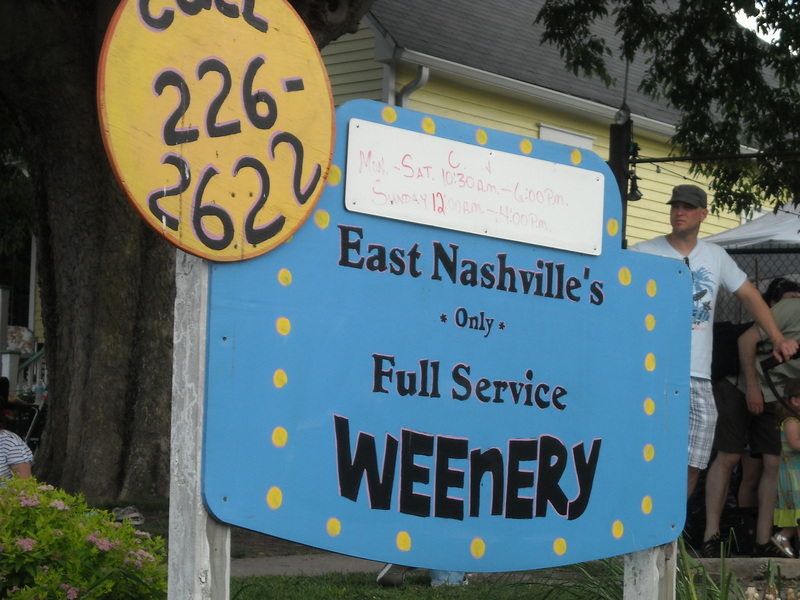 From I Dream of Weenie to Bongo Java, everything about East Nashville was great! 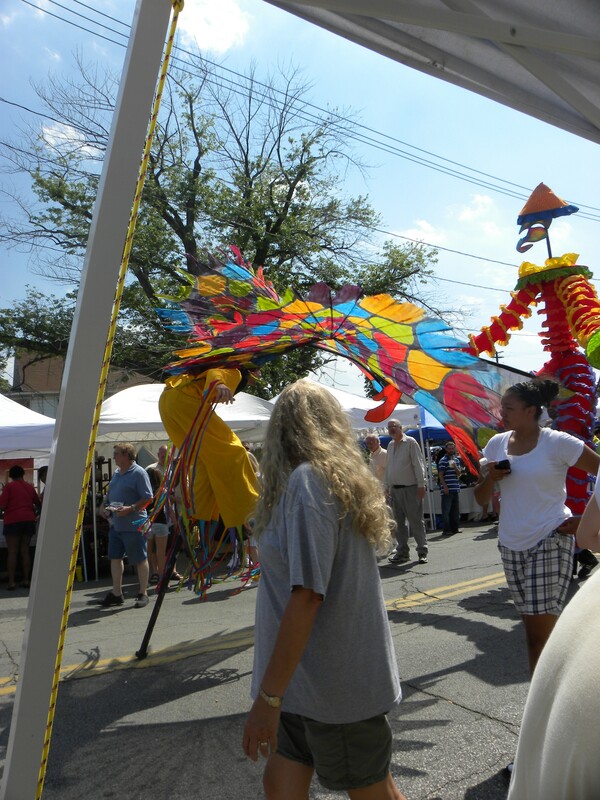 The East Nashville Arts Festival was along Woodland Street, and while the sun may have been very, very hot, everyone was super friendly- customers and fellow artists alike. I got to see some great art from many people (I’ll follow up on some of my favorite goods later this week), but I want to give a special shout out to my absolutely favorite thing of the whole festival, the Laster family and C.M. 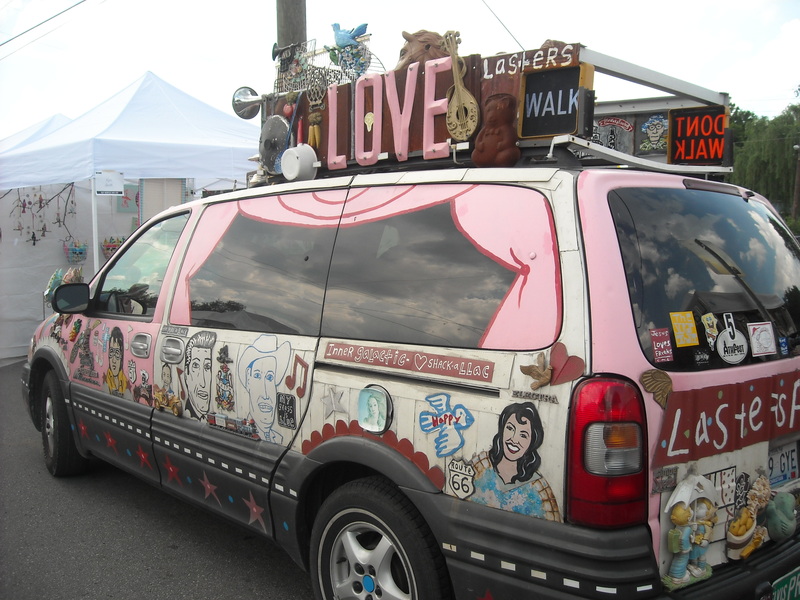 Laster’s most awesome art car. A site to behold! 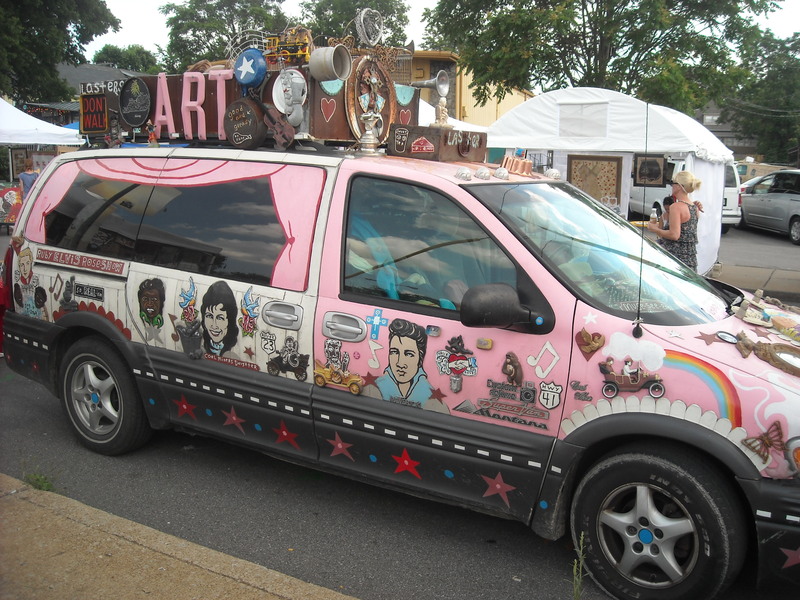 The Laster Art Car! Thank goodness we planned ahead and brought the walls for the tent so that we could block some of the sun. Next time I’ll remember to cooler and a few (hundred) bags of ice, too! 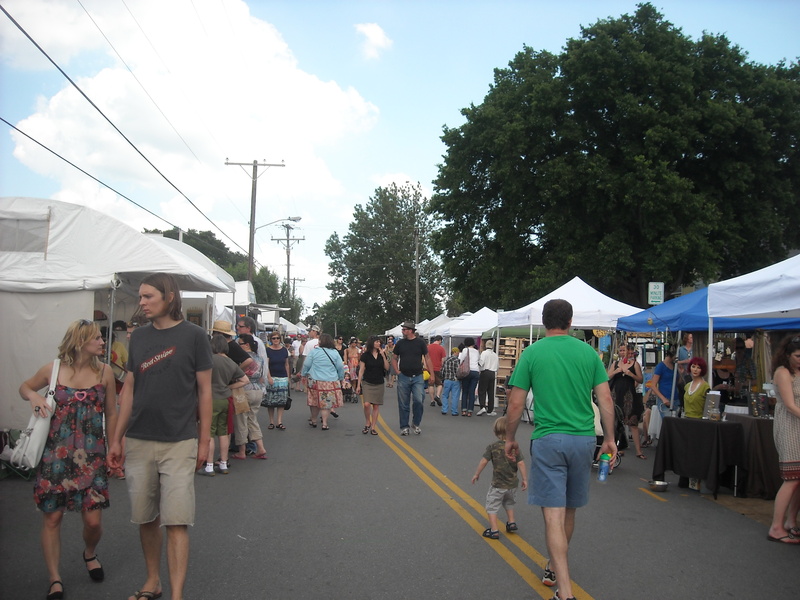 So, I can’t wait to get back to East Nashville, hopefully for the Tomato Art Festival, and I will really be looking forward to next year’s East Nashville Arts Fest! I really love Fridays. It’s my favorite day of the week for many reasons, but mainly because Friday is MY day. I work for no man and no institution; on Fridays, I only work for myself. Today has been quite a busy day. I have been running errands most of the day, but those errands have resulted in getting to go to 4 of my most favorite places: bookstore, craft store, craft store, and the other craft store. Yes, I went to 3 craft stores today (and got something at each one)! I got a new book today, The Handmade Market Place: How to Sell Your Crafts Locally, Globally, and Online. I started reading as soon as I got in the car (don’t worry, my husband was doing the driving) and I am only about 20 pages in, but I already love it. I can’t wait to finish reading this book! My new jewelry display stand! After the book store, I hit the craft stores and got lots of supplies. I got this new-to-me display stand the other day at Midland Arts and Antiques, and it required some gussying-up, so I got what I needed to do that, as well as some other supplies for a super secret project I hope to share later next week, and I also got some other supplies I needed like resin and a new circle hole punch. This week my dining room table turned into my favorite place to work. I’m not sure why this happened, but the likely cause is the fact that the craft room has become a total disaster area (again). But this picture is the dining room table. Well, it’s under there somewhere, I swear! I know it looks like a total mess, and it is (yes that is a half-consumed bottle of wine from 2 days ago, an almost fully consumed bag of chocolate Cadburry Mini Eggs, deodorant (why? 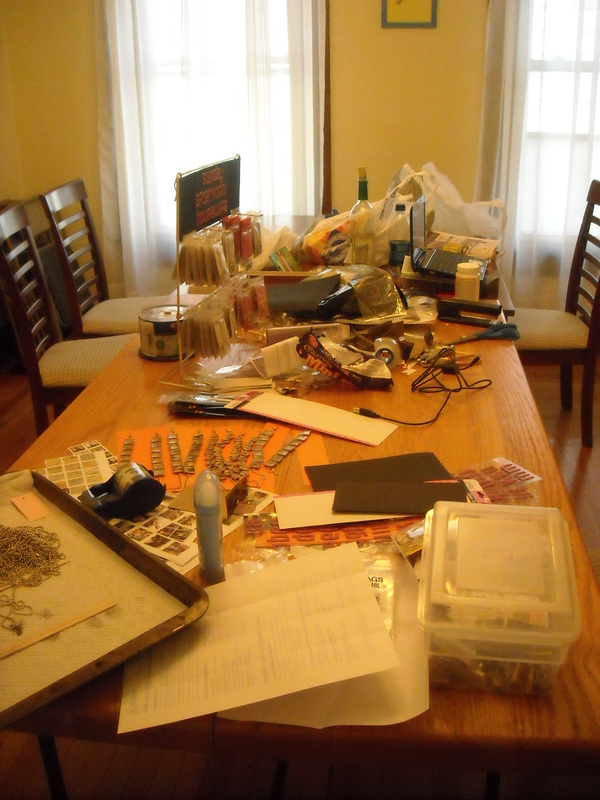 ), but holy craft, I got a lot done this week in this cozy, crafty mess! I’ve also spent a lot of time this week working on packaging up these new goodies (see the display picture). Packaging always takes more time than I think it should. I’m hoping to figure out a way to stream-line this process in the very near future. A little cherry on the top of the week is that late last night, I got word I have been accepted to attend the Waterloo Arts Fest in Cleveland, Ohio in late June. 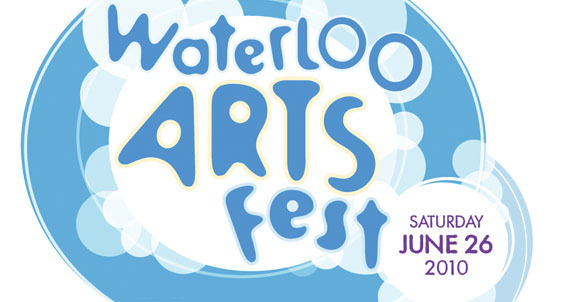 The Waterloo Arts Fest News follows news from last week that I was accepted into the East Nashville Arts Festival in Nashville, Tennessee in late May, which means I’ve got to get my suitcase packed because I’m hitting the road the next couple of months! What feels really great is that earlier this year I told myself I wanted to go to at least 2 more states this year for fairs, TN and OH, and now I feel great because I get to go! I’m going to update my goal for the year and hope that I might now be able to add Illinois and either Michigan, Wisconsin or Minnesota to the list for the year. Whew! Ok, so one last plug: if you are in the Mooresville area tomorrow, I’ll be at the high school from 9am-3pm for the 26th annual fair there. It should be a fun day- there are raffle prizes, food, and more. Stop by and say hello, but if I don’t see you, have a great weekend! 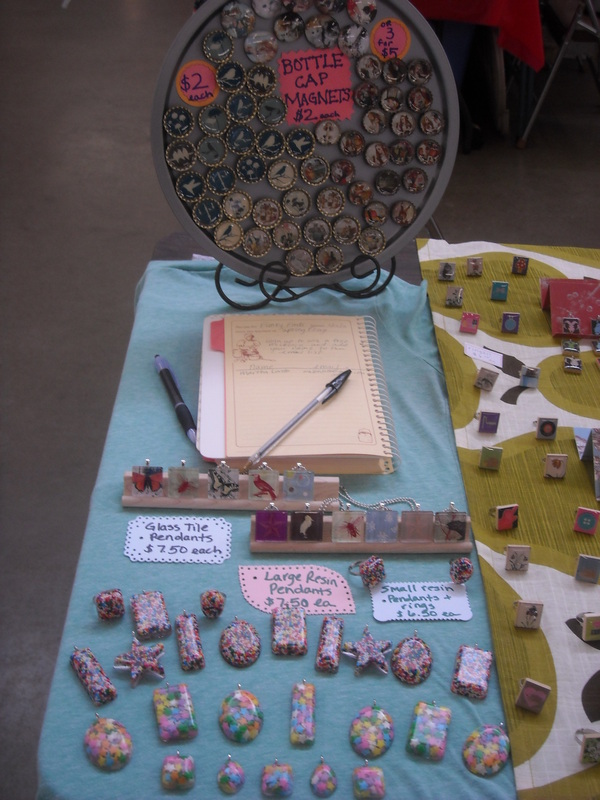 About a month ago I wrote about how to have a successful craft fair, and today I want to write about how to have a successful out-of-state craft fair. It’s the same basic idea of course, but you have to remember what to pack! If you’ve been following along then you know that earlier this month, I spent 10 days in Texas and went to 3 fairs. Before leaving I was so worried about packing everything I needed. I posted a poll and a blog asking what was the most important thing for you to pack, thinking this might help me to decide what to pack, and the answers with the most response? Extra Inventory, with 40% of the vote. Other responses included extra cash/change, and extra supplies (so you could make more product during the fair). Still, I felt like I couldn’t make up my mind, so I just packed everything. Yes, everything. Supplies to make more product, extra inventory, extra change, extra clothes…. I even made a craft fair packing list (available below), and so you’d think with all this over-packing I would have had every last thing I needed, right? Right? My table cloth was too short for the table I rented! 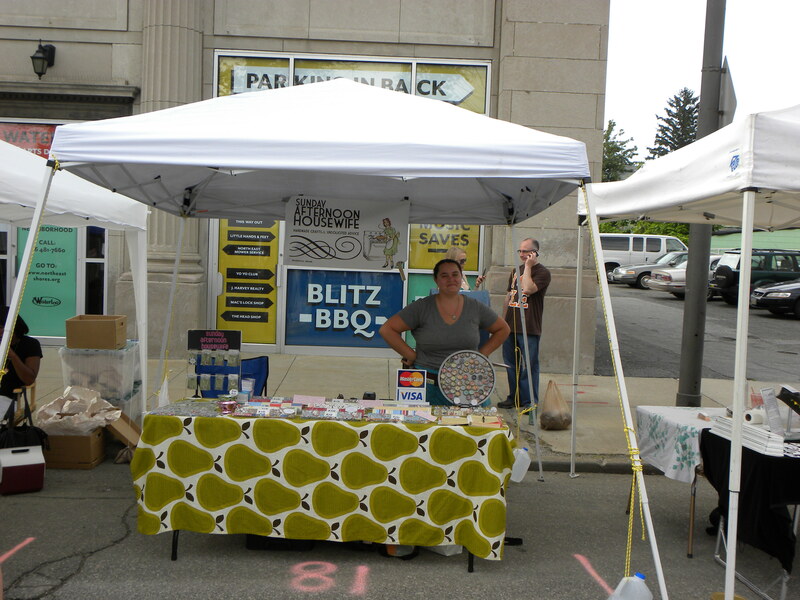 Within the first few minutes of showing up to my fair and starting to set up my table, I realized my table cloth was too short for the table I had rented. I didn’t have the option to run home and get a longer one seeing as I was over 900 miles away! I had to improvise. Luckily I had my clothes with me too, and I decided to use a tee-shirt to cover that last foot of table. So, I didn’t have everything I needed after all. And I bet you can guess, I had a lot of stuff I didn’t need either. I never used my supplies to make extra product (when was I going to find the time I wonder now), I had way too many extra tee-shirts (and not enough warm clothes! ), I even brought my receipt filing book (yes, it’s thick and heavy!) and I had to lug this extra stuff from bus to bus, hotel, to house, to couch, to cottage, and then all the way back home! I did learn that for my type of product, it isn’t worth it for me to pack supplies to make extra product. I’m simply not going to have the time to do it while on the road. Resin isn’t that road friendly as it is… I also learned that I’m not going to take the time to sit down and log receipts, and no matter what, I’m not going to need 4 extra shirts. So, while I may have been both over and under prepared in certain ways for these fairs, I did feel like I learned what is and is not necessary to pack. I could’ve brought a longer (or extra) table cloth instead of the extra shirts, and basically I could’ve had more room for souvenirs! I hope, if nothing else, you will consider my experiences when you begin to pack for your first out-of-state or out-of-town craft fair. I created this CRAFT FAIR PACKING LIST you can and use, even modify for your specific needs. Let me know if it helps you out, and please share in the comments some of your out-of-town craft fair experiences. I’d love to hear them! 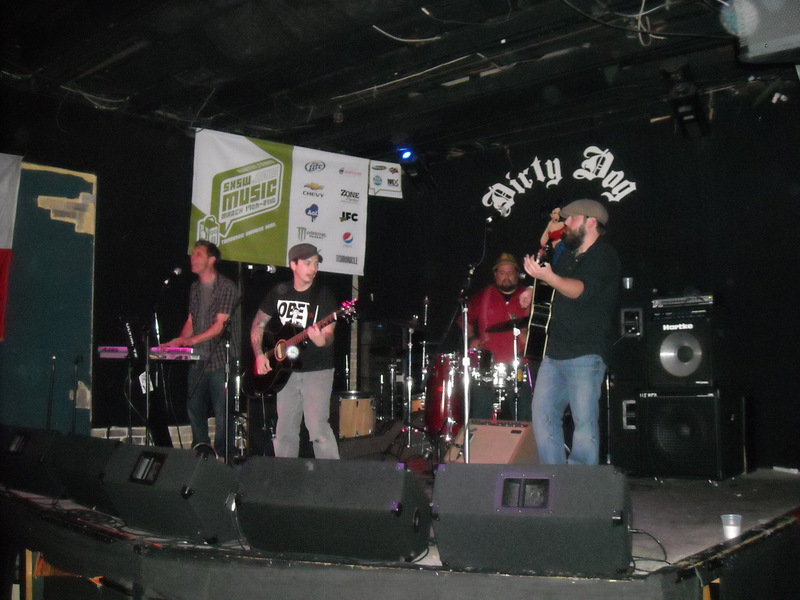 So, after a whirlwind weekend in Fort Worth, I headed down to Austin for SXSW. I was in Austin for 5 nights, 4 days, and between day parties and late nights, I did my best to find as much awesome handmade goodness as I could. One of the best places I went to scope out handmade good was on South Congress Street. 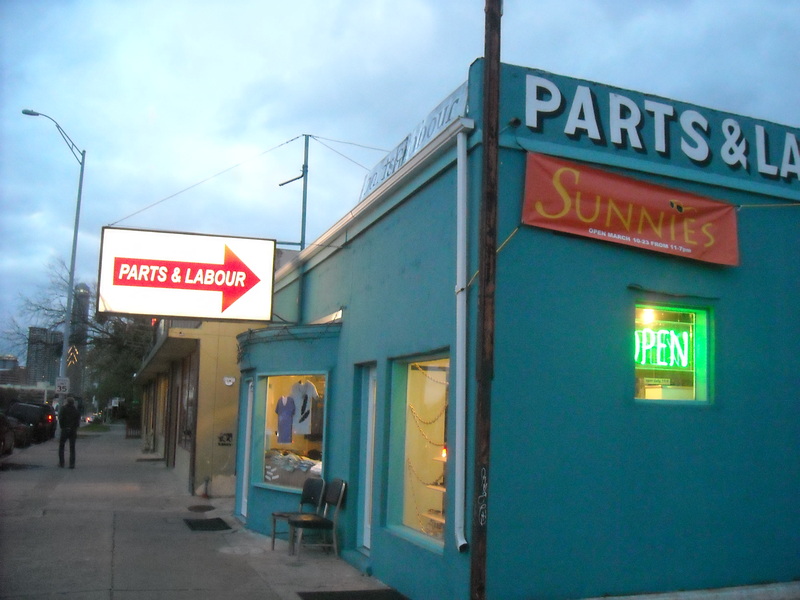 I didn’t get to go to as many shops as I had hoped to, but happily, I did make it to Parts & Labour. Of course I could’ve spent my entire budget in Parts & Labour, but instead I did a lot of looking and just a little buying (had to save some $$ for that Tex Mex food!). Parts & Labour featured some awesome Austin crafters like Naughty Secretary Club and Sublime Stitching, and I also spotted some tea towels from quirky silk- screeners (and co-Funky Finds participants) Squid Ink Kollective. All of there items were naturally fantastic, but there was lots of other great stuff, too. 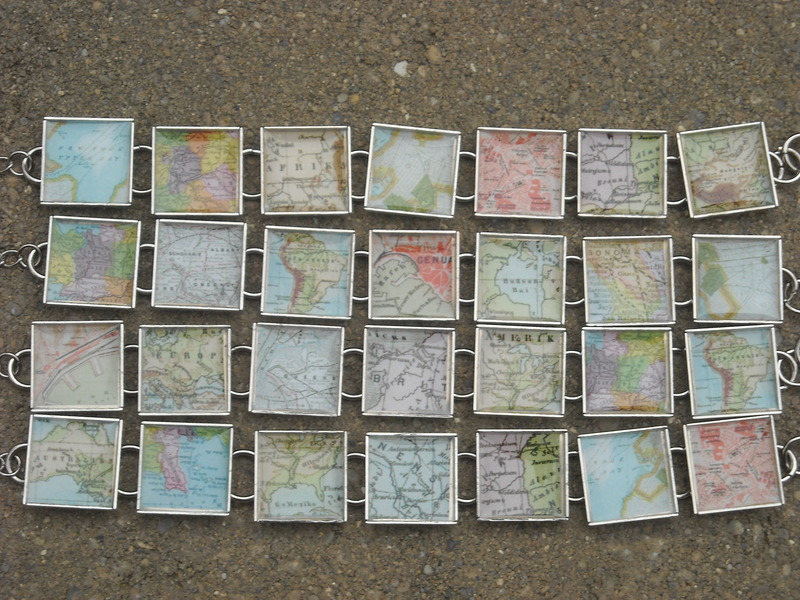 One jewelry designer who really held my attention was Sarah Eastep of maneki designs. maneki’s designs were all very gorgeous, flirty, and fun. Her website is really lovely, too. I am a big fan of the fox vs. rabbit necklace and, of course, of the owl bangle. 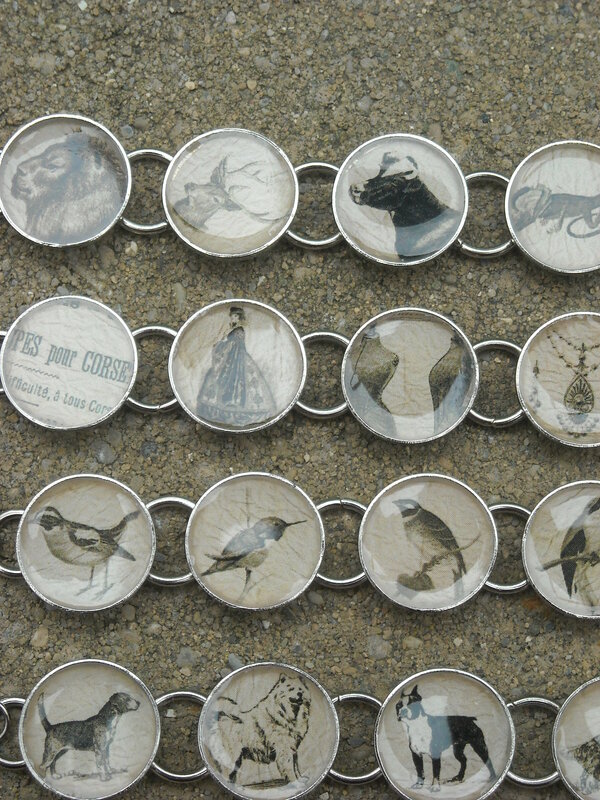 Another great jewelry designer I spotted at Parts & Labour was MetalsGirl. I couldn’t resist buying one of her small herb and resin pendants for a mere $10. 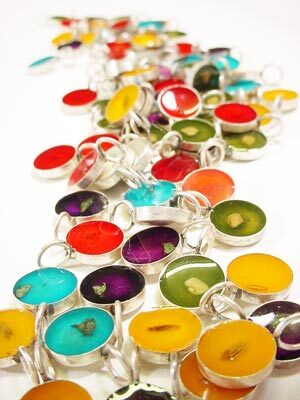 These adorable resin and herb charms came with a card that lists what each color and herb represents. I picked up a robin’s egg blue charm (one of my favorite colors!) with ginger, which the card says represents passion, power, and success. The lady working the register told me to be sure to check out the MetalsGirl website, and I suggest you do the same. 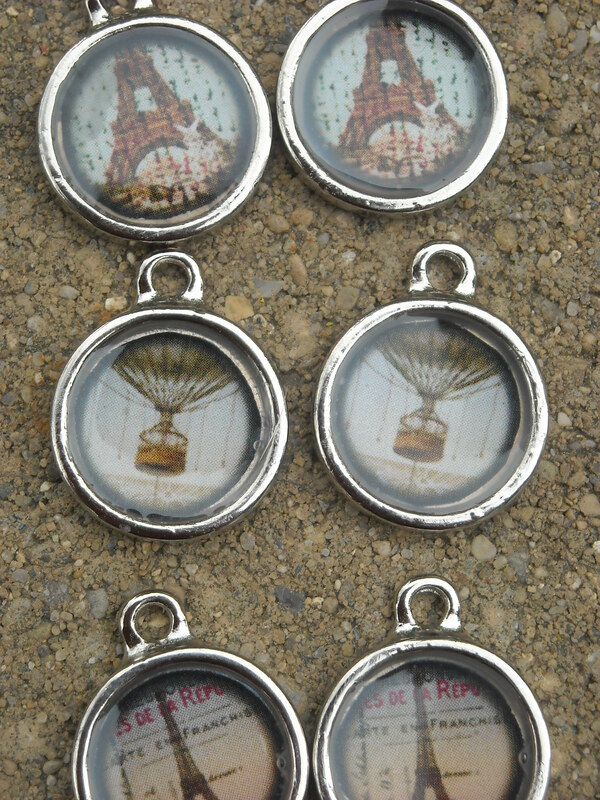 She has lots of other charming necklaces and some really, really fun bottle cap key ring designs on sale for only $5 each. The same night I went to Parts & Labour, I stumbled into a party called South by San Jose. There were lots of clothing vendors set up, but the one that made me part with my hard earned dough was South Side Sanctuary. 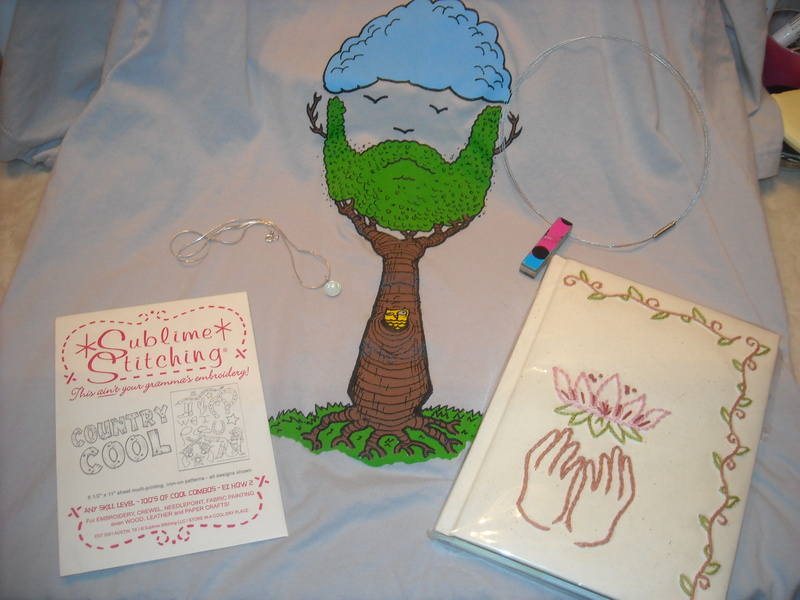 I got a really awesome treehouse/ beard/ hoot owl shirt (see below). South Side Sanctuary has a lot of awesome tee shirts as well as scoop neck tees and over sized tees. These shirts are something you should definitely check out! 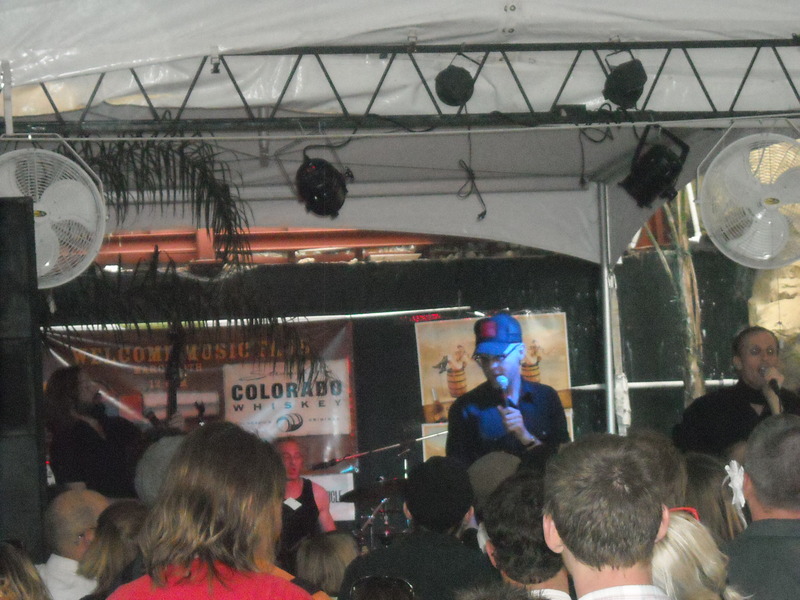 While I was at the Slim Cessna show at Habana Calle 6 on 6th street, I noticed there was an artist set up across the crowd of people, so I made my way over to check it out and I was super glad I did. 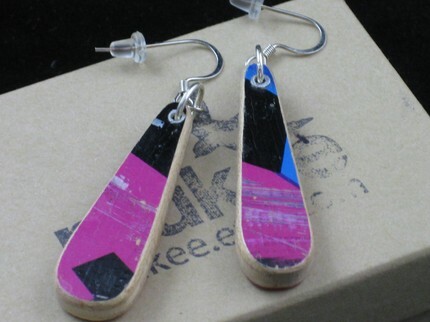 I found mukee design selling his very clever jewelry made from reclaimed skateboards. 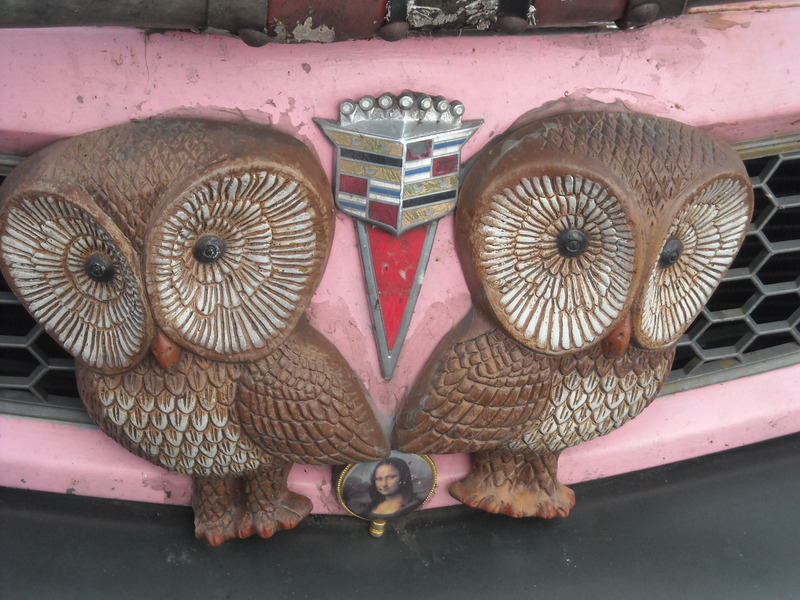 Talk about ultimate upcycling! I had a nice talk with the crafter (He’ll be at Renegade Austin in May) and was an excellent sales man! 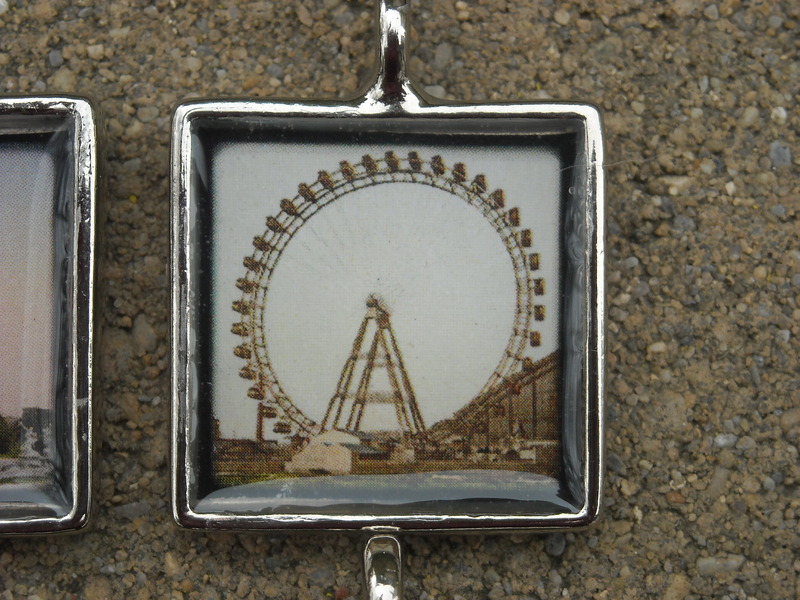 I was very happy to pick up one of Mukee’s necklaces. As you can see below, I got some really good buys while in Austin. I also had the enjoyable experience to be next to Jenny Hart at the Standard Recording SXSW day party and I whispered her secret code word and got a embroidered journal as a prize. She and I also swapped wares, and I got a set of the Sublime Stitching Cowboy Cool patterns. I am super happy with all the great goods I scored while down in Austin, TX. 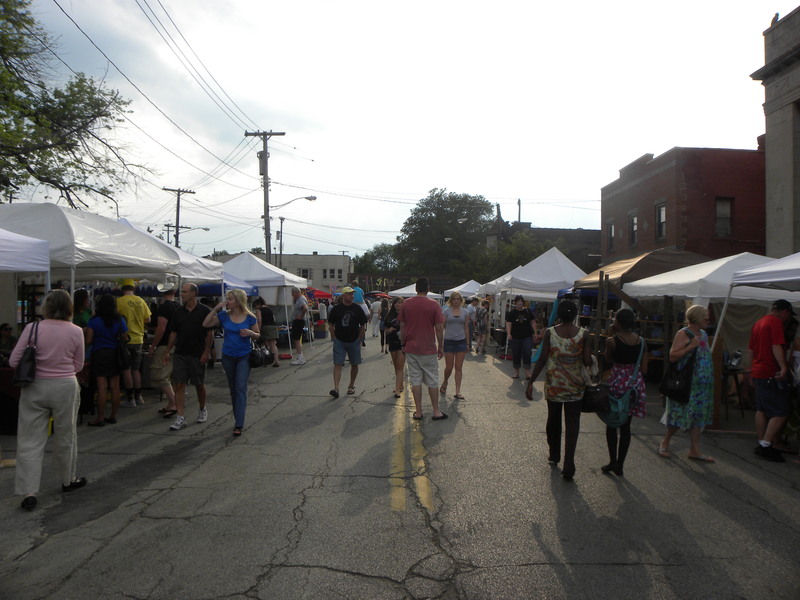 Next year I’m going to do my best to make it to the 78404 Artisans Market on SoCo. I wish I could have made it this year, but the weather was really bad that day and we had a day party. I’m looking forward to the chance to attend next year and discover tons more awesome handmade goodness in Austin. 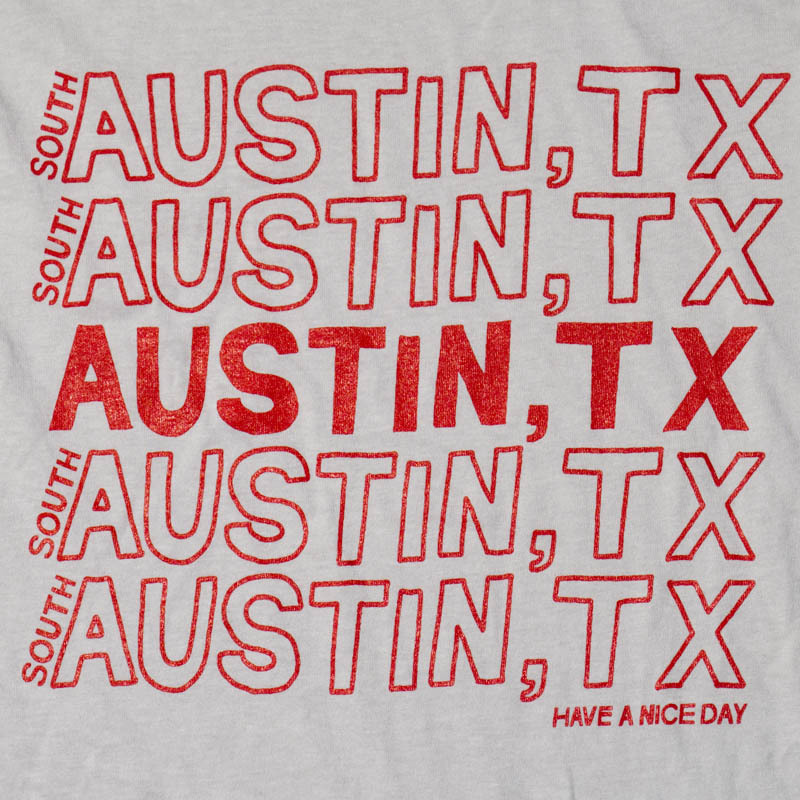 Earlier this month I spent 10 days in Texas, first in Forth Worth, then Dallas, and then Austin. First I was in Fort Worth for the Funky Finds Spring Fling. I had a great time as a vendor at the fair (you can read about my adventure by clicking here), but I also met some really great people at the fair and saw lots of awesome crafty goodness. After I finished my visits in North Texas, I headed down to Austin where I was blown away by the sheer amount of awesome handmade goodness. Today’s blog is dedicated to all that awesome handmade goodness I found while in the DFW area, and tomorrow I’ll write about all the awesomeness I found in Austin! First, as I mentioned, I was at Funky Finds in Fort Worth. One of the first vendors to catch my eye was The Curious Cake Shoppe. 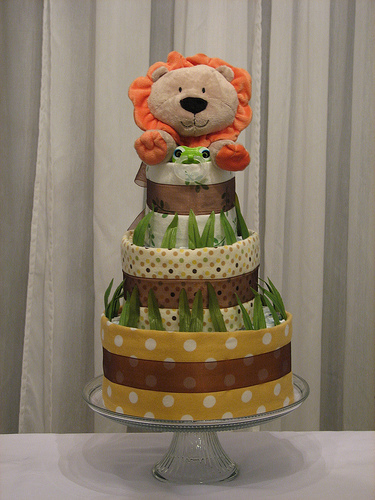 I talked with Tania of the The Curious Cake Shoppe for quite a while. She was such a super sweet gal, and I wished I had the need to buy up a cake right then! I told her I can’t wait for someone I know to get preggers so I can order up one of her awesome diaper cakes. Another vendor I saw at Funky Finds who really grabbed my attention was aplcreations. 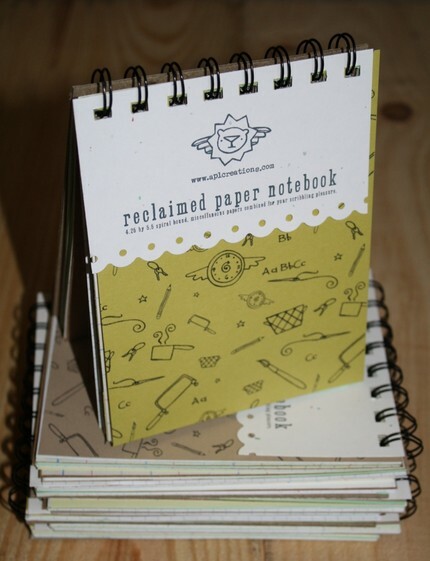 Her handmade reclaimed paper journals are both super cool and environmentally friendly. These journals are just the right size to keep in your purse or on your kitchen counter for jotting down needed grocery items. You can order these upcycled journals from aplcreations Etsy shop. 2enju was another eye-catching vendor. She had tons of adorable, well made handbags for sale. 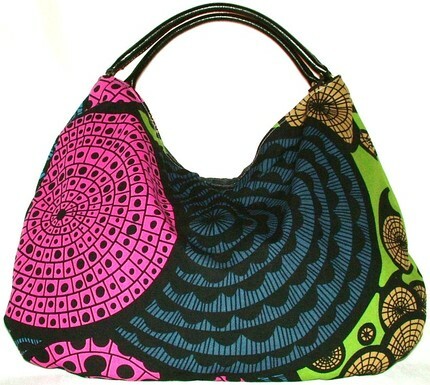 I loved all of her patterns and especially was fond of the bags that had the longer over-the-shoulder straps. She doesn’t have many of those longer strap bags on her Etsy, but you can see a lot of the awesome hobo style bags as well as gorgeous dresses and headbands. At Funky Finds I was very lucky to be situated right across the aisle from Le Pippin. All of their cute totes were staring me in the face all day long. Lucky, at the end of the day the ladies of Le Pippin came over to shop my booth and I suggested we make a trade. The awesome and functional tote I got from Le Pippin. I got this super functional, well made purse. It was perfectly sized for carrying around only the essentials while I was on the rest of my trip. 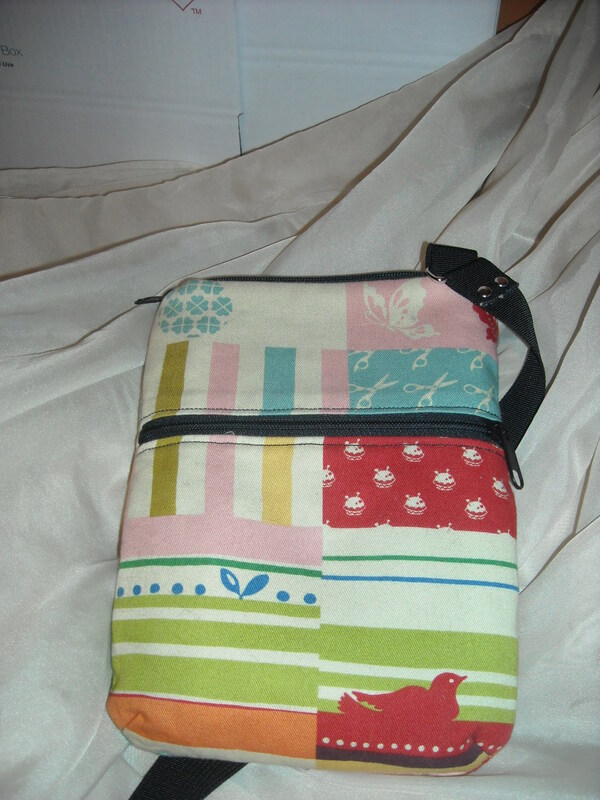 I really love my new purse and if you check out the Le Pippin Portfolio you’ll see that they make all kinds of other awesome stuff from key fobs to darling wrap-style dresses. While not a specific vendor, Etsy Fort Worth was a sponsor of the Spring Fling and they did have a booth where they were selling goods from their members to support a local food pantry. 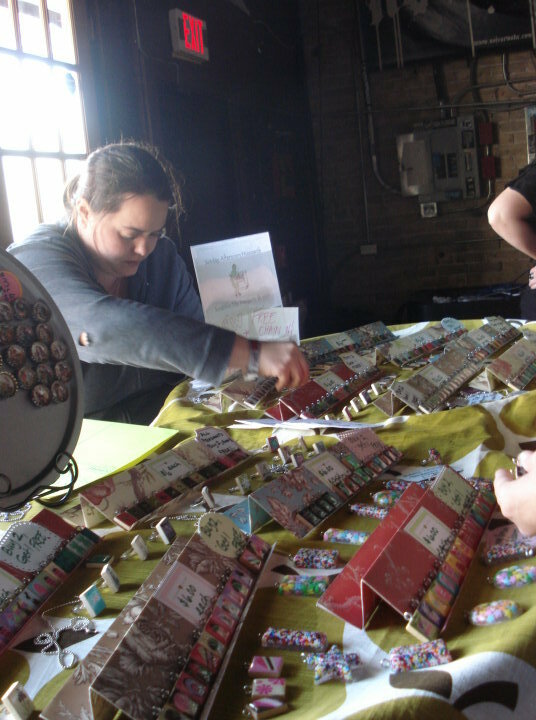 I was really impressed with the Etsy Fort Worth team’s organization. They had an awesome scavenger-hunt type promo going on during the event and all their members had team member buttons on. They have a very impressive list of members which you should take time to check out! While I did spend most of my time in Fort Worth at the Funky Finds, I had time to walk around downtown the evening before in Sundance Square. I checked out a couple of really cute shops there. One was called Earth Bones and the other, Vessels. Both had fun general merchandise, and they both also had some really nice handmade jewelry. At Vessels, I saw some nice jewelry by Karen Nellen of KKDesignz, and actually found that Karen was working behind the counter, so we chatted for a while. Right now her website is under construction, but hopefully soon you’ll be able to see some of the great jewelry I saw at Vessels. So, that is my DFW area handmade goods round up! I hope you’ll take the time to check out these awesome handmade artists and also that you’ll check back tomorrow for the Austin edition of Handmade in Texas. Sunday Afternoon Housewife had so much fun at SXSW this year! Besides visits to all sorts of bars and venues and eating at awesome Tex Mex resaurants (more on that later), I made it to the Fader Fort and to the MWTX Party, both of which were insane displays of awesome music (Frightened Rabbit, Man Man to name a few) and LOTS of people. Probably my favorite show by far was seeing Slim Cessna’s Auto Club for the 3rd year in a row, this year at Habana Calle 6. This band is one of the best live bands to see, ever! Of course all of SXSW wasn’t play. There was a lot of work involved, too! 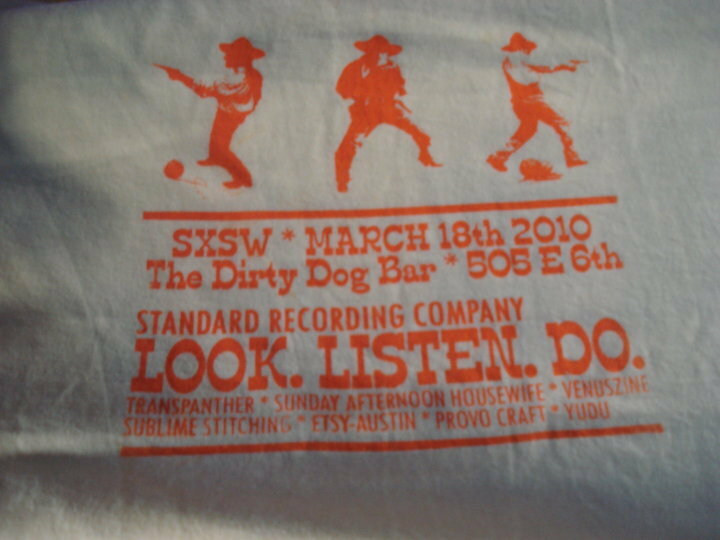 Thursday I was set up at the Standard Recording Company SXSW Day Party at the Dirty Dog on 6th street. This year sponsors Provocraft/ Yudu set up and silk-screened hundreds of shirts which were passed out free to attendees of the party. The shirts were all silk-screened on the spot, and lots of new people got to see the Yudu in action, get a free shirt, and some even got cool YuDu stickers! The shirts were a big hit! There were also lots of silk-screened tote bags passed out with the same image. 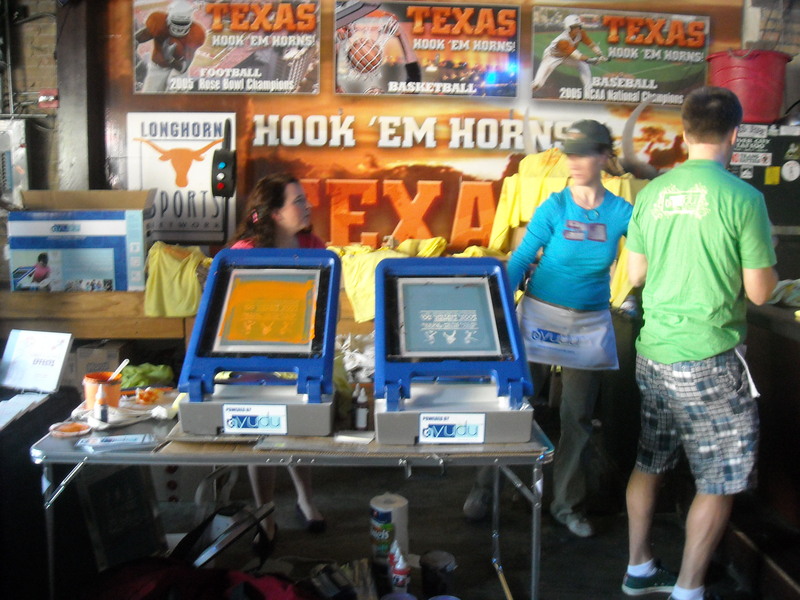 All of the shirts were yellow, but the ink colors varied from orange to brown, red, and teal! 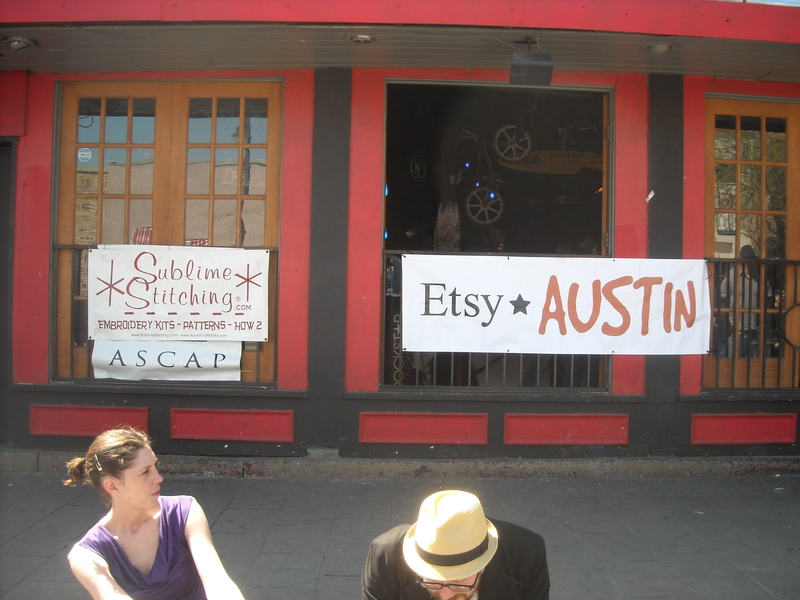 Also on hand was some of the Etsy*Austin crew. 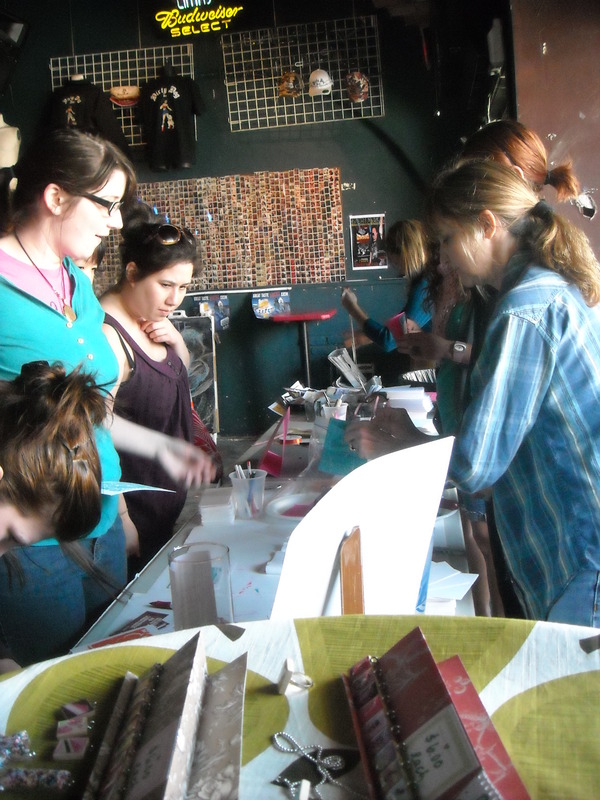 They had a make-and-take craft table and helped the party attendees make block prints and SXSW memory books! It was awesome to meet some of the Etsy*Austin gals and watch them in action. They were super busy most of the day teaching people how to make fun SXSW themed crafts. 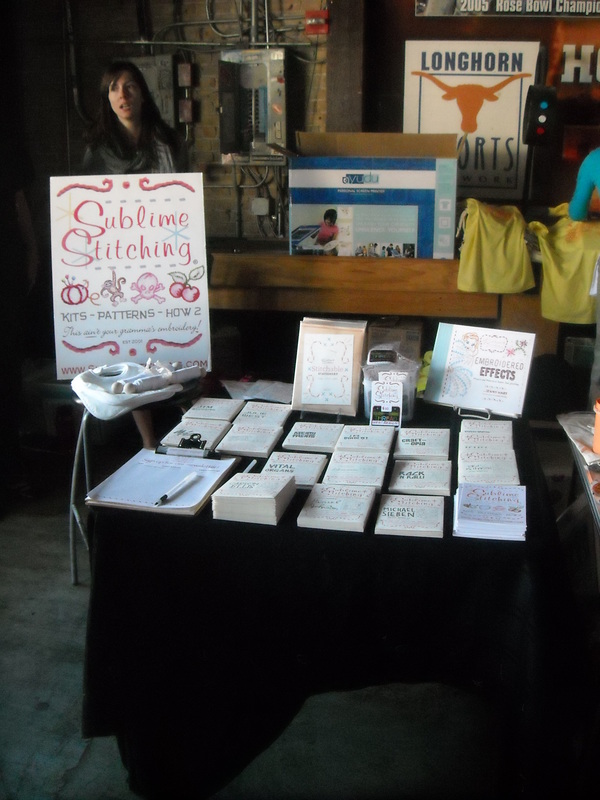 For the second year in a row, Jenny Hart of Sublime Stitching came and passed out some free goodies (but only if you knew the secret password from her newsletter!) and sold her super awesome embroidery patterns! 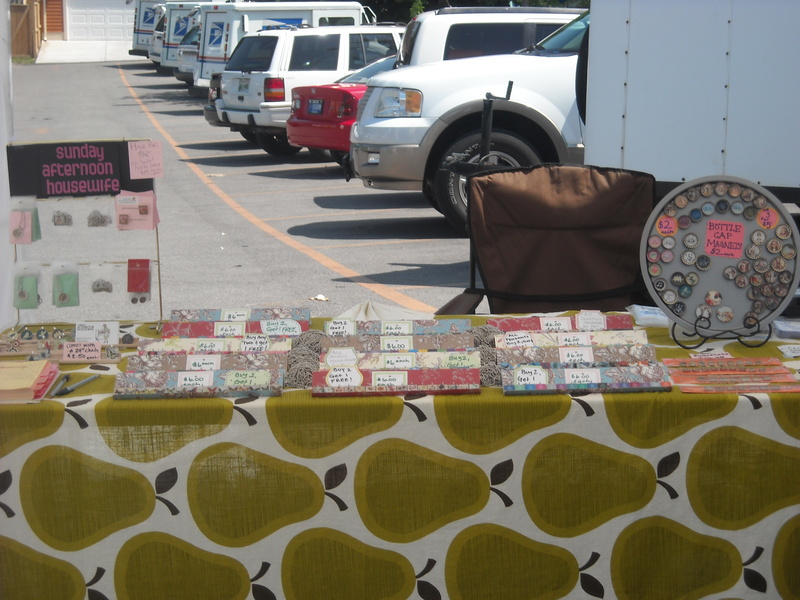 Of course I was set up to selling my scrabble tile pendants, resin pendants, and bottle cap magnets, too. I had a great time meeting lots of new people as well as meeting again some folks who came to our party last year and had bought pendants and came back for more! I even had one super sweet lady tell me she had thought about the pendants all year and was so glad she could buy some this year because she didn’t have cash last year. That made me feel super great. I was happy as could be to meet and make sales to such wonderful people from all over the United States! Sunday Afternoon Housewife (me!) working my booth at the SXSW day party! While I’ve spent all this time talking about crafts, let’s not forget we also had some great bands play some awesome music that day, too. The music that day was kicked off by Bald Eagle Refugees/ I Need Sleep, followed by Amo Joy, Harley Poe, Thunderhawk, Deadbeats, Dr. Manhattan (a new personal favorite! 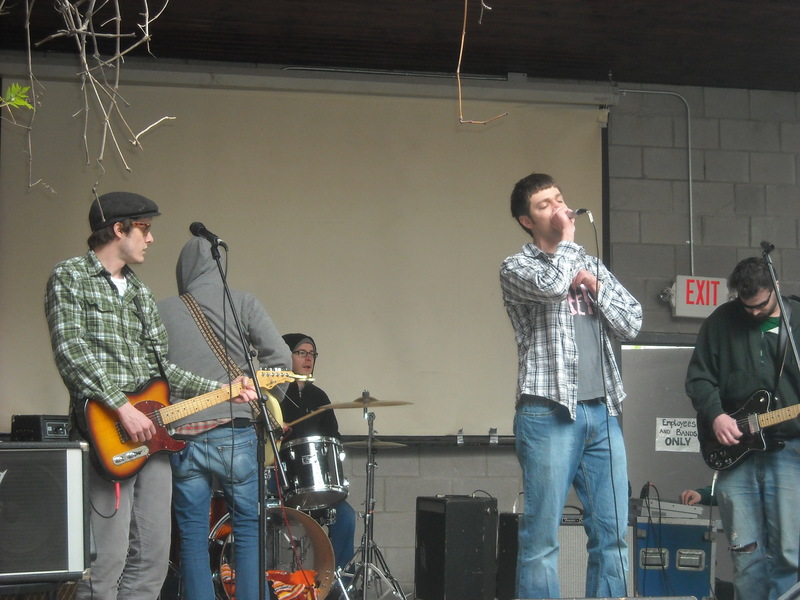 ), Casper and the Cookies, and then Jookabox wrapped the day of music up with a fantastic set and a packed house. Harley Poe was a crowd favorite! Harley Poe was a crowd favorite for sure! Super fans drove all the way in from Oklahoma and north Texas just to see them play their set! So, as if all this awesomeness on Thursday was not enough, Standard Recording Company had yet another kickin’ showcase on Saturday at Shakespeare’s Pub! The weather didn’t really want to cooperate with us on Saturday (high 40’s, wind, and moring thunderstorms! BOO!) but we were still able to set up and listen to so great music by Metavari, Deatbeats, Burnt Ones, Bridges & Powerlines, Thunderhawk, AmoJoy, and Husband & Wife. The Deadbeats played a great set as did Amo Joy and Thunderhawk. New to my ears were Metavari (who I really enjoyed!) and Bridges and Powerlines and the Burnt Ones. Husband & Wife rocked to a full room at the end of the day and everyone had a fantastic time! 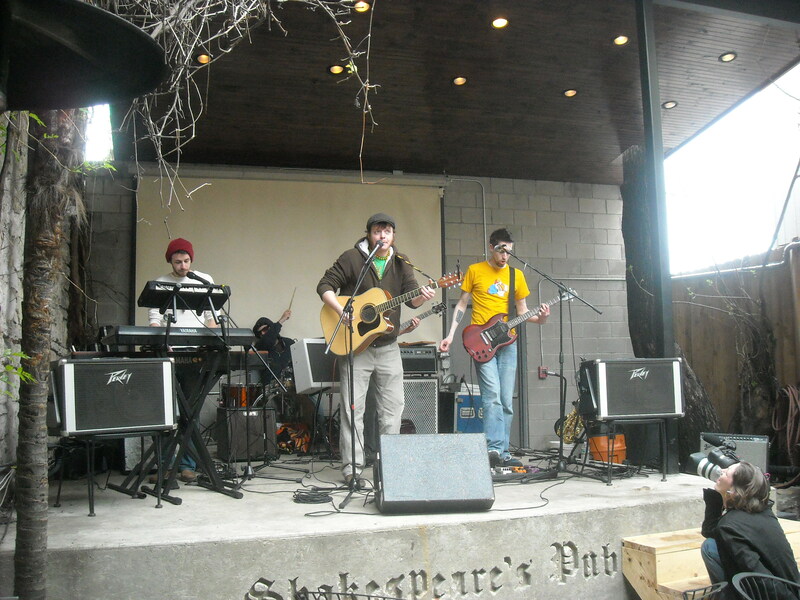 Of course I took advantage of the offer from Standard Recording to set up my goods at Shakespeare’s Pub that day. I did brisk business in the cold weather, but it was great yet again to meet new people. I even made a sale to a gent from Ireland, so now SAH is going global! 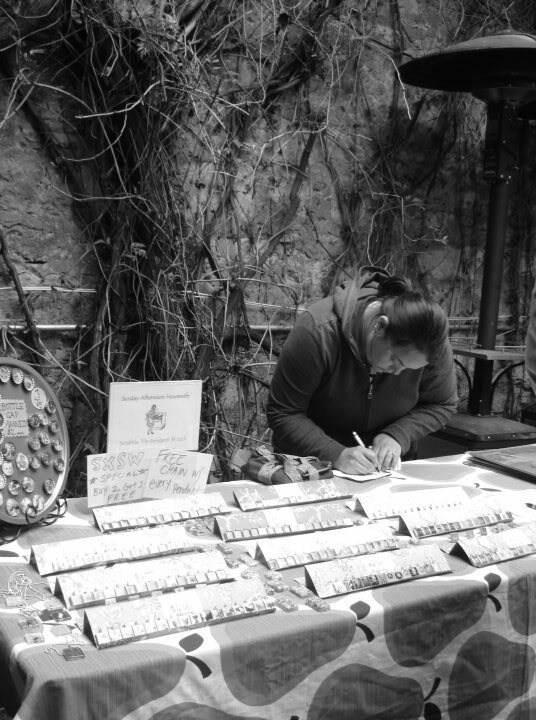 Thanks to Bryanne for this great black and white picture of me working my booth at Shakespeare’s. Well, we’ve reached the end of this SXSW wrap up. I’ve got plenty more to write about though in the coming days including some awesome handmade in Texas crafty finds and reviews of all the Tex Mex places I ate while in Austin. Also, I’ve got a lot of work to do this week to build my inventory back up before my next show on April 3rd. 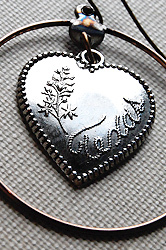 I’ll be sharing some new jewelry later this week, too, so please check back! Naughty Secratary Club- Jennifer Perkins!